End of the working week that saw a mini May heatwave. With no driver, hopped on two wheels and scooted down The Street (hello Red Lion), then Top Street, and up a zigzagging footpath to the roundabout where the B1438 meets the A12. Yep, that A12. Gripped handlebars tightly, closed eyes and didn't reopen them until we'd parked & locked by the buggies and the shoe valet. 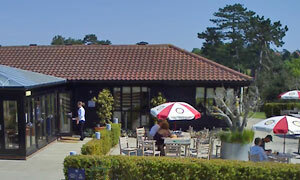 It's tee time at Seckford Golf Club. Would have chosen outdoor seating but seemingly not enough parasols to go around on The Terrace. No problem: plenty of space in the light, airy and affluently vibed interior. Liked the simple black & white printed menu. CSO: Counter Service Only. Eye caught by the daily specials. That'll be two chicken caesar wraps, if you'd be so kind. Sipped, chatted, tried to work out the relationships at other tables, and waited. Thought our order had been lost in a bunker when finally our two plates emerged. Now, on these Friday trips, it's rare for the food to speak for itself: step forward the Waterfront and the Oaks. But this is good golf grub. Full of taste, imaginative side salad, well presented ... and, surprisingly good value too. Who'd have thought? Cleared plates and found that some ladies had lunched and left. Took terrace table for a kicking latte and a gooey wodge of carrot cake while gazing at the landscaped first few holes. Somewhere in the 1:30pm haze could be seen the otherwordly Adastral Park radio tower, a reassuring distance away. Sorry to leave and face cutting across both lanes of a major trunk road. If it was a car -- Lexus SC. If they were passing by -- Gary Lineker.